1.Cantilever rack can provide flexible storage and easy access to your non-pallet-sized material such as lumber, pipe, tubing, steel bars and furniture. 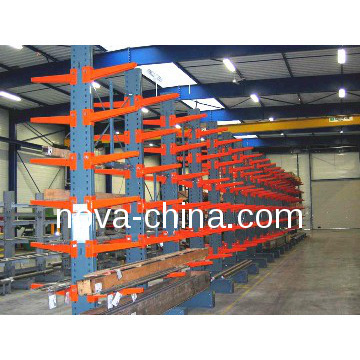 2.Cantilever rack is a freestanding storage unit with horizontal load carrying arms extending outward from a single vertical column. 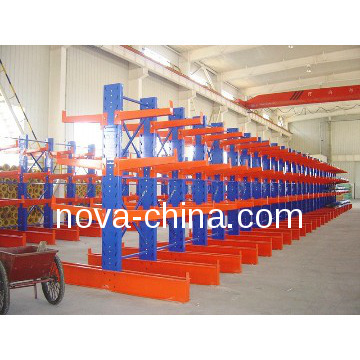 The absence of a front column makes cantilever rack faster and easier to load and unload than selective pallet rack, lowering your handling time and costs. NH1 TYPE (Upright 80),NH2A TYPE(Upright 90A),NH2B TYPE(Upright 90B),NH3 TYPE(Upright 100) ,NH4 TYPE(upright 120),NH5 TYPE(upright 140) ,NH6 TYPE(Upright 160) or customized by clients. Loading capacity: 500-8,000 kgs UDL/beam level. High-quality Powder Coating Finish or Galvanized. Paying special attention to providing customers with quality products, the company has trained a professional team of engineers who always aim at developing advanced logistic equipment. 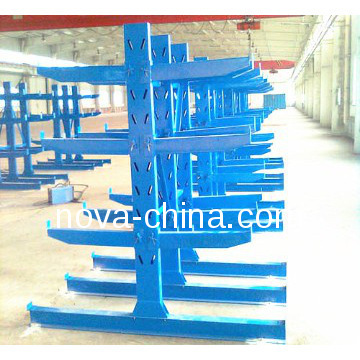 Presently, our company is equipped with more than tens of automatic production lines, hundred sets of general equipment and three GEMA painting systems for producing a wide range of racks. In Nova, the whole process including design, purchase of raw material, production, quality control, installation, after sales service, ect is complied strictly with ISO9001, ISO14001 and ISO10012.